Four fabric mesh curtains that can be rolled up or down and ventilated mesh windows on all four sides. 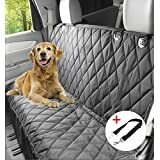 Please check the dimensions to make sure this is the correct size for your pet. Easy to assemble thanks to its simple Zip-up construction feature. Size: M: 60cm x 42cm x 42cm; L: 70 x 52 x 52 cm; XL: 82 x 58 x 58 cm. 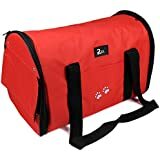 COSY PET CARRIER WITH TOP & SIDE OPENINGS - The Pet Carrier makes journeys for your cat, dog or rabbit a more comfortable experience than transport in a plastic box. 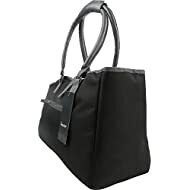 It has three zipped openings, one on top and two on the sides. 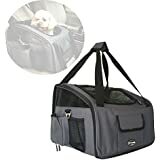 SUITABLE FOR ALL SMALL TO MEDIUM PETS - The pet carrier is suitable for pets up to 12kg. There are 2 strong carry handles on top and it is big enough for most small and medium dogs, cats, puppies & kittens. 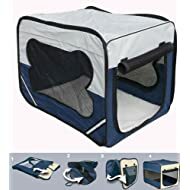 STEEL FRAME & MESH SIDES - The carrier has a sturdy steel frame with mesh sides so your pet has plenty of ventilation and can see what's going on around them. For nervous pets there are privacy blinds that can be rolled down to help keep them calm. ZIPPED POCKET & DETACHABLE BAG - Keep your pet's favourite treats and toys close to hand with the zipped size pocket and detachable storage bag. These can also be used to hold a harness and lead, or to hold medication on the way backs from the vets. Find the perfect dog cat for your Mool, AVC, Ellie-Bo, Songmics and Heritage or another brand.